Did you hear?… A rare 1982 copper penny that was recently discovered sold for an astounding $18,800! The good news is there may be more rare pennies out there just like it — and you could be the next person to find a rare copper penny in your pocket change. The reason this particular 1982 copper penny value is so high is because it’s a rare 1982 small date penny. What’s The 1982 Small Date Copper Penny Worth? The only known 1982-D Small Date copper penny sold for $18,800 at a Stack’s Bowers auction on August 3, 2017 — no joke. The coin has light wear and was found in circulation. In other words, it looks just like any other ordinary 1982-D Small Date penny you might find in your spare change. Can you imagine… a penny worth nearly $19,000 just floating around in circulation? Of course, you’ve got to know what you’re looking for — because to the unaided eye, this rare penny might not look or feel any different than the highly common zinc 1982-D Small Date pennies. You’re probably wondering if it’s easy to find a rare 1982 copper penny like this Small Date variety. Only one has been discovered so far, but relatively few people take time to really search their 1982 pennies, too. The average circulated 1982 penny is worth 2 cents or less — so most people don’t think of these old pennies as having much value. If you’re diligent, you might find a 1982-D Small Date copper penny or another valuable error coin like it. So, if you find a 1982 D penny, keep it! You’ll need weigh all of your 1982-D pennies. The most efficient, foolproof method is to check them each with a gram scale — which you can buy at a local big-box retail store or online for less than $20. Checking the coin’s weight is the easiest way to determine whether a penny is made from a copper-based (brass, in this case) alloy or the copper-plated zinc composition that virtually all other 1982-D Small Date pennies are made from. 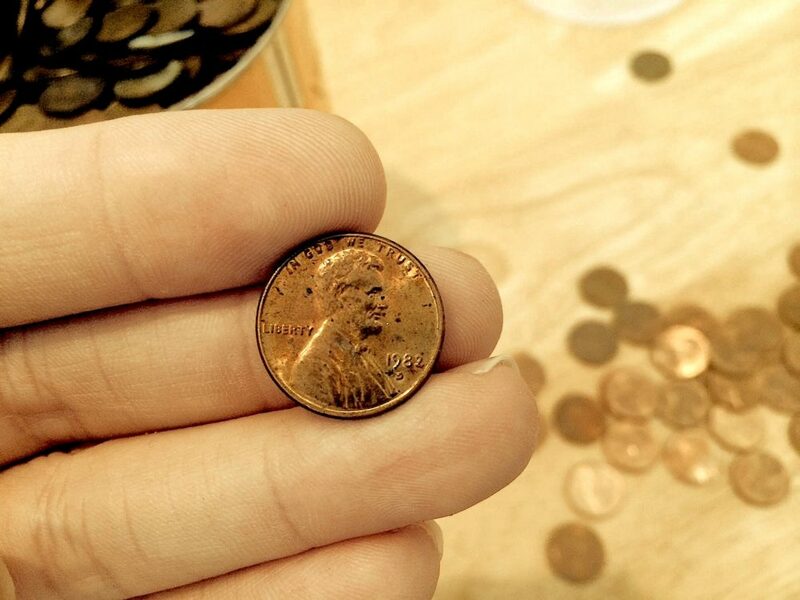 A 1982 copper penny has a tolerance of 0.13 grams — meaning that it could weigh between 2.98 grams and 3.24 grams. A 1982 zinc penny has a tolerance of 0.10 grams — so an authentic one could weigh as little as 2.40 grams or as much as 2.60 grams. And what about the small date? How can you tell a 1982-D Small Date penny from a 1982-D Large Date penny? On a 1982-D Small Date penny, the tops of all the numerals appear to be aligned, and the bottoms of the “1,” “8,” and “2” will also appeared in alignment. Once you get used to looking at 1982 large date vs. small date pennies, you’ll be able to tell them apart from a mile away! Where did the valuable 1982 copper penny come from — and why is it so rare? The 1982-D Small Date copper penny is known as a transitional error coin since it was minted from copper during a year when the United States Mint was beginning to make zinc pennies. The US Mint switched from copper (more specifically, brass) to copper-plated zinc pennies — due to rising copper prices. This wasn’t the first time the Mint had traded copper pennies in for a less-expensive type of penny. Less than a decade earlier, in 1973, the U.S. Treasury and Mint developed a less-expensive type of penny, and aluminum became the metal of choice. The Mint struck more than 1.5 million 1974 aluminum pennies. While many were given to congressmen and others for inspection, they were soon recalled when government officials decided the coins weren’t going to become official. There were worries that the aluminum pennies wouldn’t show up on X-rays if they were swallowed by children, and the vending machine industry took aim at the new penny — which they claimed wouldn’t work without expensive overhauls to equipment across the country. Copper prices also temporarily dropped, and the 1974 aluminum penny didn’t stick around. Yet, only a few short years later the debate rose again as copper prices soared. By 1981, the U.S. Treasury was back to work on creating a cheaper metal for the penny — and the copper-plated zinc composition was born. The first zinc Lincoln cents, or Zincolns, were minted at the West Point Mint on January 7, 1982, and the last official business-strike copper pennies were made late in the year. The 1982 West Point zinc pennies have no mintmarks — so they look like Philadelphia pennies and can’t be distinguished from them. With the addition of the 1982-D Small Date copper penny — which was made at the Denver Mint and has a “D” mintmark — there are now 9 known 1982 penny varieties. It’s theorized that the 1982-D Small Date copper penny was created when a brass planchet, or prepared coin blank, was left in the Mint’s coin hopper by accident and was inadvertently fed into the coining presses. At least one (and perhaps many more) were unknown — until the first one was discovered by Paul Malone on November 23, 2016. He found it while sorting his 1982 pennies. It was the first-ever reported discovery of a 1982-D Small Date penny. What’s amazing about this coin is that it took nearly 35 years for it to be found. And what’s even more incredible still is that there are likely more out there just like it waiting to be discovered. Maybe you will be the next person to find a 1982-D Small Date copper penny! Why Is The Rare 1982 Copper Penny Worth So Much? You’re probably wondering who would spend nearly $19,000 to buy a 1982-D Small Date copper penny. Actually, there are tons of people who want rare error coins like this penny. The US Mint isn’t supposed to make mistakes. So when it does (and creates neat coin errors like this 1982 penny error), everybody wants one! However, since only one of these 1982 copper pennies has been found so far, there certainly aren’t many to go around. In fact, off-metal error pennies are very popular rare coins, and several have sold for well more than $10,000. 1943 copper penny — This is one of the most valuable rare pennies, and it’s worth more than $100,000. 1983 no mintmark (Philadelphia) brass penny — These rare pennies have sold at auctions for as much as $23,500. 1983-D brass penny — This coin has sold for more than $15,000. 1989-D brass penny — One sold for $22,325. 1990-D brass penny — These are worth up to $15,000. A brass penny should weigh about 3.11 grams. A zinc penny is 2.5 grams. Good luck, fearless penny collectors!